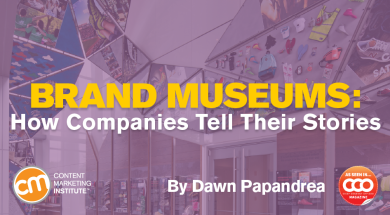 As brands seek new ways to tell their stories, some are finding value in creating brand museums to showcase their company history and heritage. Whether it’s a dedicated space in a flagship store or global headquarters, or a standalone venue such as the Harley-Davidson Museum in Milwaukee or the Mercedes-Benz Museum in Germany, nostalgic on-site visitor experiences can be an effective form of content marketing. “Heritage plays really well with audiences,” says Jason Dressel, managing director of client strategy and development for The History Factory, a heritage-management agency that recently helped launch the New Balance Global Headquarters Visitor Engagement Center and museum display, among many other projects. “There’s a reason why there’s ‘throwback Thursday’ and ‘flashback Friday’ on social media. People respond favorably to this kind of content,” he says. 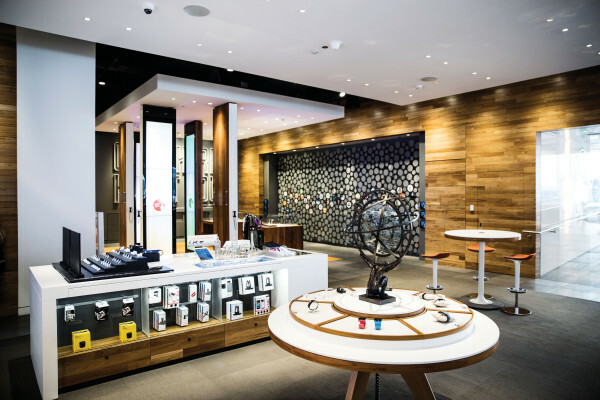 AT&T’s Jonathan Lander, director of visual merchandising and retail brand marketing, says, “Brands that have a rich history and have authenticity really have license for this kind of undertaking.” Under his watch, the brand recently launched the Journey of Innovation environment in its flagship store in Chicago. “When you do something like this you don’t want to just pat yourself on the back. You have to be very careful to show how it benefits the consumer and the world, and not just yourself,” he says. Take an in-depth look at how AT&T and New Balance are effectively telling their brand stories by looking into their past, and what went into these content-rich projects. 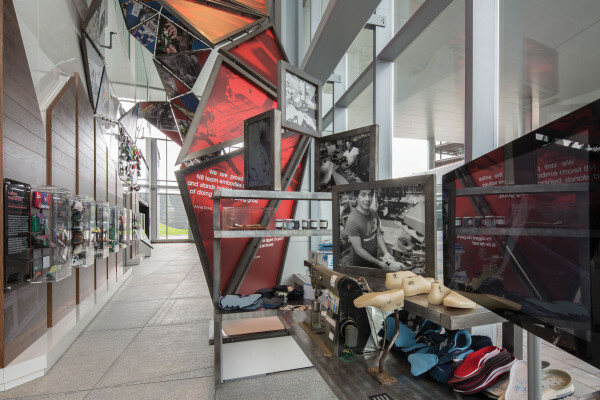 When New Balance began building its new global headquarters in Boston, the plans included a visitor engagement center in the atrium that would appeal to a variety of people. “We knew visitors would include athletes, global collaborators, and even customers. But first and foremost we thought of our associates (employees),” says Christine Madigan, vice president of responsible leadership at New Balance. The goal was to focus on the company’s culture, and how its history helped shape its products, its people and its philanthropy. Madigan says the first big challenge was finding relevant content. “The History Factory had great ideas. We were moving out of our old building so we held contests and asked people to look at what was underneath their desks or hidden in closets at home. We knew generally what we wanted to say, but we spent a good amount of time figuring out what we had so we could showcase and tell those stories,” she says. In fact, they engaged associates from around the world. “The outreach for artifacts and story ideas wasn’t just with the 600 people here, but with the 5,000-plus associates around the world,” says Madigan. By targeting some long-term staffers, they gathered scores of interesting items, such as an associate’s passport showing all the places he traveled to for business — demonstrating the company’s global growth. Focus groups and interviews with senior leadership drove story arcs and helped the team decide what to prioritize, says Madigan. Of course, the museum also houses items that appeal to athletes and running enthusiasts, such as Jenny Simpson’s 2011 Track & Field World Championships gold medal for her 1,500-meter win. “We made sure that we paid attention to big-picture goals, but also every little detail,” says Madigan. New Balance began as a company that engineered insert soles for footwear, which were inspired by the three-clawed chicken foot, that allows for a perfectly balanced step. That piece of brand iconography influenced the 3D tripod design of the atrium. “We were working with a unique space — narrow, but long and tall. It was great to be able to use the tripod design, which also represents New Balance’s three core values: integrity, teamwork, and total customer satisfaction,” says Madigan. Within each “leg” are smaller triangles that tell individual stories. In addition to the visually appealing structure, there are digital kiosks for visitors who want to learn more and showcases featuring company artifacts. “We offer a variety of experiences. Some visitors might be waiting for a while and have time to peruse, but others might only have a few minutes,” says Madigan. When AT&T launched its 10,000-square-foot flagship store in September 2012, the intent was to connect with the consumer. Selling smartphones was not the first goal, says Jonathan Lander, director of visual merchandising and retail brand marketing at AT&T. The space in the rear of the store was being used as an art gallery showcasing local artists, but it wasn’t luring in visitors and engaging them. Lander brought in a retail-design agency to think through the ideas AT&T wanted to communicate. “Innovation isn’t a singular moment in time or a unique item, but takes place over 100 years at AT&T, starting with Alexander Graham Bell. Without giving that foundation of history, we really couldn’t tell the story of today and the future,” he says. Lander refrains from calling the space a gallery or museum. “It’s primarily an environment with new innovations, but with a very healthy dose of reverence for what AT&T was born from,” he says. The planning involved a year of research, poring through archival material and hours of digital content that dated to the 1930s. Among the popular artifacts chosen for display are the first transistor and Bell’s notebook. “People are fascinated by that,” says Lander. And the huge letters on the 12-foot wall that say, “Come here I want you” (Bell’s first spoken words on the telephone), draw visitors to the once-ignored space. Alongside the artifacts are five touch-screen columns where visitors can learn about the present and future of communications. Perhaps the most popular spot is the wiki wall, which features 80-plus photo disks. Guests can interact with the wall using virtual reality; aim an iPad toward a photo on the wall to learn the story behind it. “Each (photo) tells a story of how AT&T participates in the global community,” says Lander. “Not a week goes by without tour groups and school groups coming through,” says Lander. And by encouraging the #attmichavenue hashtag on signage throughout the store and outside, AT&T brings the in-person experience to digital platforms. The space has earned AT&T a lot of media coverage, and won industry awards for Lander’s team. “It’s been a real feather in our caps,” he says. Do ample audience research before and during development. “We do a lot of prototyping and research at every stage. Before we flesh anything out, we talk to visitors about what they already know about the content to find out where they’re coming from so we can build on their previous knowledge,” says O’Hara. Consider the different types of visitors you will have. When developing the museum’s most recent exhibit, the Yawkey Gallery on the Charles River, O’Hara says it was important to mix hands-on interactions with sections that would allow for some reflection. “There are different personalities. One person may want to engage physically, while another wants to read more of the descriptions,” she says. Offering a range of things in proximity to each other allows groups to be together, but individuals can do the things that appeal to them. Experiment. It’s important to test your exhibit. “If you’re going to add interaction or physical manipulation, make it durable. People will use items in ways you never expected,” she says. Don’t let the coolest artifacts distract from your message. Many times there’s a disconnect between the content brands begin with, and the content needed to communicate the intended message, says Dressel. For instance, one of his railroad company clients that wanted to spotlight its safety innovations ultimately scrapped an exhibit that focused on its early passenger rail services. “The company had beautiful artifacts we could have included from their bygone era of passenger rail, but we mutually concluded it was irrelevant to their communications goals for the museum,” he says. Have a strong plan to execute against. As obvious as it sounds, be clear about your objectives at the outset. Everything — your staffing model, budget, facility space, and content and design strategies — should be driven by what you’re looking to accomplish. Clients are often inspired by ideas they see in history museums or other cultural institutions, but those organizations generally have a very different mission than the objectives of a company or brand.